Although you might assume that Arthur Miller's play The Price is about the amount of money being offered by the second hand furniture dealer as "the price" is frequently referred to, the underlying theme is about the price we pay for the paths we chose to take in life. Each decision leads to a path rejected and the weight of that memory is what divided the brothers in Miller's play. Often the decisions we make are based on inadequate information and it is only with the perspective of decades that we can evaluate what was given up. 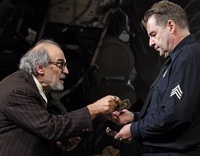 Brendan Coyle plays Victor Franz a police sergeant nearing retirement. In 28 years he has made only 19 arrests. His wife Esther (Sara Stewart) would have liked him to be more successful, like his brother Walter (Adrian Lukis) a doctor. The catalyst for the two brothers to come together is the furniture left in their parents' apartment which has to be moved as the apartment block is about to be demolished. Victor has left a few messages with Walter's secretary asking him to phone but Walter never takes his calls or phones back. Central and yet also incidental is the man who Victor has asked to value the furniture. As Gregory Solomon, the 94 year old furniture dealer complete with greying beard, long hair and a "shiny with age" suit, David Suchet has lost his suave look of so many Poirot roles. Much of the first act sets up the play. Gregory tells us about his three wives and then remembers it was really four. Victor and Esther spar over the retirement future as she wants him to start a better career and he lacks the drive. Simon Higlett's set design goes overboard on a pile of old chests of drawers and chairs the full height of the stage, in natural dark wood on the left and painted pale blue or white to the right. We know what kind of furniture they are talking about and how it is too large for modern apartments. When you have seen a few Arthur Miller plays, the themes of the past and family secrets resonate with the regrets that his characters have about what might have been. There is also who to blame for an opportunity not taken. They are profoundly deep plays with a dramatic sense of slow disclosure. The expertise of a playwright at the top of his form is matched only by the casting and performances here. Brendan Coyle gives the affable Victor a hesitant charm sadly coupled with our frustration at his dithering lack of resolve. Sara Stewart's Esther convinces you that she has probably had more than one drink as she erupts into shouting at Victor, while she sports her much admired new suit, which has cost twenty times that of a cinema ticket. She made me shudder. There is a huge fuss too when Victor has coffee spilt over his suit and if he has to go to the cinema in uniform, Esther is concerned that "everyone will know how much you earn." Adrian Lukis has the debonair assurance of a successful medic, smooth, persuasive and not one to take Gregory Solomon's financial assessment of the furniture without questioning it. "We were brought up to succeed," he says. There are affectionate moments when the brothers recall their family life, the fencing foil and mask, the mother's harp before they grew apart and bitterness enhanced sibling rivalry for Victor. Gregory Solomon has relatively little to do in the second act but David Suchet's performance is a delight as the seasoned man of experience, worldly wise and the humour is always present. He can play flattering Esther but when she tries to intervene in the negotiations, his "Darling, why don't you leave it to the boys!" makes us laugh at the sexism and yet we admire the efficient way he shuts the querulous Esther up. The Price is one of Miller's best plays and it is only the second time I have seen it. Last time in 2002 the late Warren Mitchell played Gregory Solomon review . It is a valuable addition to the Miller canon.